The Community Foundation for Kingston & Area (CFKA) awarded 16 grants totaling $165,478 to local charities which will directly benefit over 4,000 people, half of them youth, with thousands of others to benefit indirectly. As is typical of Community Foundation granting, projects funded are from a wide range of fields of interest and of variable size, benefiting a large number of charities in Kingston and surrounding townships. Grants awarded ranged from $3,180 to the Open Voices Community Choir to enable them to offer a free show for 700 kids at the Grand Theatre entitled “What If Kids Ran the World?” to two projects totaling over $50,000 to address Children’s mental health. One of those projects is a $26,680 grant to the Canadian Mental Health Association – Kingston Branch for a project “Kids Get Stressed Too”. “Kids are not immune to stress. Anxiety and stress in childhood can lead to social withdrawal, difficulty in school, negative physical symptoms and long-term repercussions in adulthood. The Canadian Mental Health Association (CMHA) – Kingston Branch is pleased to be able to offer our Kids Get Stressed Too! program in schools and on site for the next year. Over 600 children will have the opportunity to participate in the Program.” Said Judi Burrill, Executive Director of CMHA Kingston about what the impact of this grant from the Foundation means to them. Amongst the broad range of projects funded – from arts and culture to youth – the Foundation is pleased to fund three environmental projects totaling nearly $20,000, including a $11,944 grant to Friends of Kingston Inner Harbour for a project “Tracking and Talking About Turtles” which will help their 50 citizen-scientists collect and communicate data about the local turtle population. “Whether small or large we believe that all of these projects will have a positive impact in our community and look forward to hearing about how things go over the coming months “said Gayle Barr, Chair of the Foundation’s volunteer grant review committee. 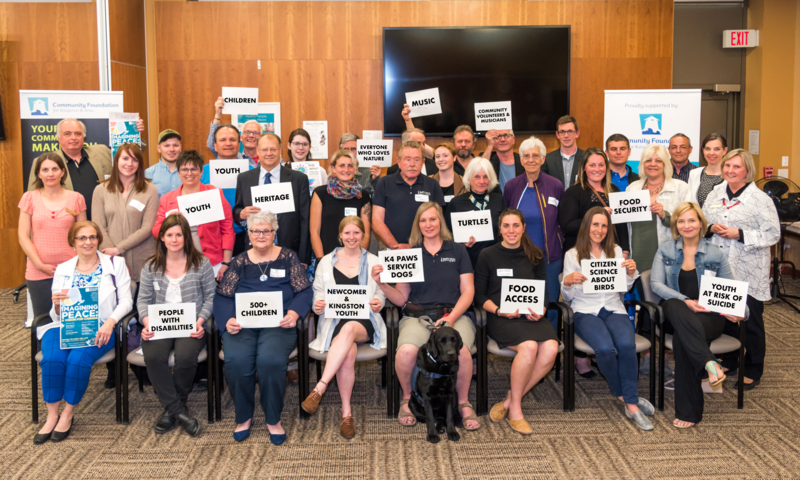 Grants were awarded at an event May 14 where each recipient had the opportunity to speak for 60 seconds about their project and how it will benefit the community. Funding for these annual grants comes from the income produced by the Foundation’s endowments, which have been established and and built by local donors. The Foundation has two community grants rounds per year, to which all local charities can apply. To date, the Foundation has funded 341 unique local organizations and invested over $2Million in local charities through its Community Grants Program alone. The next application deadline for local charities is September 15, 2018. Acknowledging 10 years of community volunteerism, 10th Anniversary of Home Grown Live Music Festival and Community Parade, Screening of “Kingston Live” and the Planting the Seeds events. It is about sharing skills among accomplished and early-stage musicians, encouraging others to take up music, networking, consolidating community partnerships, playing music and recognizing our talented and generous music community. Voices is picking up the rest of the tab. counsellors to reach diverse populations where they already are to support this initiative. elementary schools and at the CMHA venue. collaboration, while providing access to healthy food. Imagine Peace: PeaceQuest Kingston Gathering brings peace-builders to Kingston’s waterfront to mark the centenary of WWI’s end on November 11, 1918. Engaging regional leaders and many from across Canada, the event invites us to challenge fear and imagine a future marked by empathy and democratic participation; featuring discussion with regional panelists, Sen. Kim Pate and peace scholar Paul Rogers, it concludes with an afternoon concert at The Isabel. for participants of all ages. The A2A Trail – A Pilgrimage for Nature – is a physical and symbolic link connecting Algonquin and Adirondacks Parks. Using existing trails and backroads, the Trail winds through diverse and beautiful natural environments, and past many historical and cultural landmarks. The Connecting the A2A Trail to Kingston project will define a connecting link between the main A2A Trail and Kingston, cumulating in a community trek along the link and a trail celebration in Kingston. Turtles are our neighbours, yet we know so little about them. This CFKA-funded project, “Tracking and Talking about Turtles in our Midst”, intends to find out more about the turtles that live in Kingston’s Inner Harbour, telling others about these findings, and bringing more scientific rigor to the work of citizen-scientists. will build community connections while sharing skills and meals. We can’t wait! We currently have a computer lab that provides free computer/internet access to a variety of clientele in the north end of Kingston. One-to-one support assistance will provide opportunities for individuals who may be unaware of how to use a computer due to an obstacle from a disability. trained in suicide intervention, at no cost. The volunteer crisis responders will likely encounter over 500 members of our community considering suicide in their volunteer responsibilities. appreciate these eerie artefacts of our maritime history. Camp Outlook offers young people a chance to develop their inner strength, self-worth, and capacity to succeed. Since 1970, Camp Outlook has provided backcountry canoe trips at no cost to youth from the Kingston Area. We are excited to be offering a growing program this year to build community between newcomers to Canada and youth originally from the Kingston area on a nine-day canoe trip in Algonquin Provincial Park.